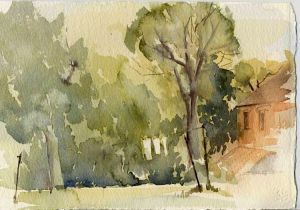 Sometimes finding a subject simple enough to be painted in around 30 mins is possibly a great way to achieve the unspoiled watercolour. This latest demo at my watercolour class today was in essence just that. The subject was just enough and could be completed in about half an hour though not everyone managed it. There were only two washes. Colours were yellow ochre, cobalt blue and burnt sienna, with a touch of cadmium yellow. We all copied this painting which I made last summer for a video demonstration. It was executed plein air, on my knee without my easel – perhaps I should do more this way. A watercolour painted in such a short time cannot be spoiled – it takes another 10 minutes to do that! Put your washes down and where your brush touches the paper, must not be touched again until it’s dried. So by the time the wash has dried and you’ve applied your second wash 30 mins has just about passed. What can be easier than that? By the way, if you’re interested in learning to paint in watercolour have a look at : https://www.facebook.com/SunshineHouseCommunity I teach there every Friday morning.